AeroMessenger allows you send free messages, read news headlines and summaries, as well as create your own to-do list. In a nutshell, AeroMessenger is a smart and cost-effective messaging tool that keeps you informed even when you're on the move. 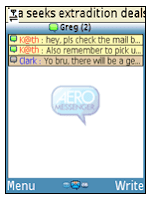 AeroMessenger is free to download and use, but your cellular service provider may charge you under 1c/message for the connection.